The second Oxford Brewers Homebrewing Competition took place on October 18th 2017, and focused on English Porters (see the official guidelines). 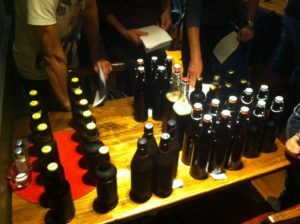 A total of 11 brewers offered their poisons to a panel of judges. The winner was Tom Rhodes with his Really Oughtta Porter, for which he generously provided the recipe. Major props! We naturally thank the Chequers, on High Street, for hosting the event. Cheers!